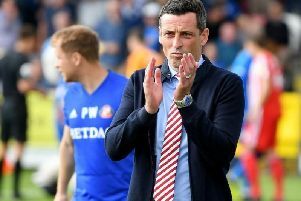 Jack Ross says the players have picked themselves up from their Wembley disappointment without his intervention. Sunderland fell to a penalty shootout defeat as Lee Cattermole's penalty miss proved decisive as Portsmouth lifted the Checkatrade Trophy. Much has been made about the need for the Black Cats to refocus quickly ahead of a crucial and busy period in the quest for automatic League One promotion. And Ross' side could begin their road to redemption at Accrington Stanley tomorrow, where a win will put them three points behind second place Barnsley with two games in-hand. "It is draining," said Ross after going the full 120 minutes with Pompey. "But we'll need our full squad throughout this period - not just on the pitch but off the pitch. "I sensed from them very quickly that they've always had a huge motivation to achieve promotion - it's driven them on all season. "If anything, the disappointment has fuelled that even more. "I certainly haven't sensed that they need me to pick them up, i think they've done that themselves, which is really encouraging." Ross also praised the Sunderland fans for their reaction to the Wembley defeat and understanding their is a bigger goal to achieve. He added: "Yeah and I'm grateful for that. It's probably inline with how the players have felt. "They were really sore because losing in those circumstances and surroundings is painful. "But very quickly, I sensed from them the understanding that there is a bigger prize to have this season and what we have to do to achieve that. "I'm pleased supporters have probably looked at it the same way."